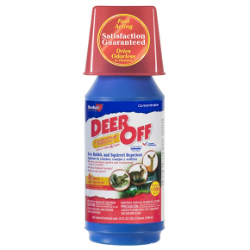 This powerful formula repels deer, rabbits, and squirrels With its patented Dual Deterrent System; this formula creates a barrier of both scent and taste. Enough repellent for 400 4-foot ornamental shrubs or 3,500 square feet of plantings Weather-resistant formula lasts up to three months. Made from natural and food-based ingredients it contains putrescent eggs solids (4.63%), garlic (.001%) and capsaicin (.001%). EPA registered, OMRI® listed, and compliant for organic gardening. Includes easy-to-use measuring cup!